Find out more about the Lorex 4K Ultra HD IP NVR System with pricing, features, and FAQs. 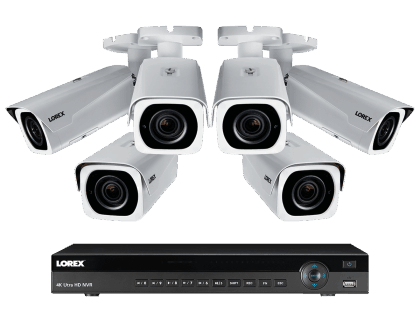 The Lorex 4K Ultra HD IP NVR System with 6-Outdoor 4K-IP is a Lorex security camera. Suitable for your home and business, the camera is packed with features including 4K Ultra HD footage, long-range night vision, and extreme weather durability. 6 × 4K white bullet IP cameras. Pros: Good video quality with key features. The implementation period is easy. Cons: Delivery can be delayed. The software is clunky. Bottomline: Great choice! Offers comprehensive features with high-quality video. However, the software needs improvement. What are some alternatives to the Lorex 4K Ultra HD IP NVR System with 6-Outdoor 4K-IP Cameras? Where can I buy the Lorex 4K Ultra HD IP NVR System with 6-Outdoor 4K-IP Cameras? The camera is available via Amazon and the Lorex website. Does the Lorex 4K Ultra HD IP NVR System with 6-Outdoor 4K-IP Cameras work at night? Yes, it is a nocturnal camera that offers up to 250 ft. infrared vision range, and up to 175 ft. color night vision. Can the Lorex 4K Ultra HD IP NVR System with 6-Outdoor 4K-IP Cameras be used in any weather? Yes, the Lorex 4K Ultra HD IP NVR has a sub-zero feature. It has received an IP67 environmental rating and has been tested in various weather conditions.